Desmond Louis Donnelly entered the House of Commons in the general election of February 1950 as the first Labour MP for the highly marginal Pembrokeshire constituency. 1 At just 29 years of age, he was the youngest Labour MP in the new House of Commons. From the outset he was widely viewed as something of a political maverick and was initially seen as an avid follower of Aneurin Bevan before in 1954 veering sharply to the right within the Labour Party and becoming a supporter of the new party leader Hugh Gaitskell who had succeeded Clement Attlee in December 1955. He also forged a close friendship with George Brown who became the deputy leader of the Labour Party. Throughout these years Donnelly was seen within the Labour Party as a rather dubious, unreliable character, ever liable to defect to another political party and one who could never really be relied upon to toe the party line. When Gaitskell died very suddenly in January 1963, and an intensely fought contest for the party leadership ensued with Harold Wilson and George Brown as the forerunners, Donnelly became one of Brown’s leading campaign managers. But it was of course Wilson who succeeded Hugh Gaitskell as party leader and indeed became Labour Prime Minister in October 1964. 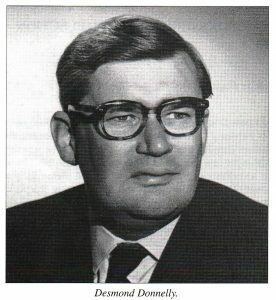 Although Donnelly’s position within Pembrokeshire seemed very secure – he had a substantial majority of 8586 votes there in the 1964 general election – he was predict­ably not offered even junior ministerial office by Wilson and subsequently became something of a backbench rebel constantly sniping at many aspects of governmental conduct and policies. We can acknowledge that it was brave, but it revealed the great flaw in his position. While attacking the Government for its foreign and defence policy, Mr. Donnelly said: ‘I do not take back a single Socialist principle’ . Minutes before Mr. Sandys had declared to a thunderous applause that it was our duty ‘to cut the canker of Socialism right out of our system’; and in the speech that followed, Mr. Amery told us that there was a clear alternative to the Wilson foreign policy for Britain, and that was provided by the Conser­vative Party. Here is a man who proclaim s his Socialism, but repudiates the policies of a Socialist Government. Here is a man who is blind to the fact that socialism has failed on the three occasions it has been tried , under three different leaders, because the system is wrong, and not the personality at its head . Here is a man who says he is a Socialist while putting forward the declared policies of hi s political opponents. Here is a man who, for all the words he has uttered , has for more than three years sustained the Government by his presence in the Labour Party, and by his failure to pass through the Opposition lobbies. For all his words he has not changed Govern­ment pol icy, and he will not change it. M r. Donnelly can not dodge the central dilemma: politics is about power and government. During the same impassioned speech, Edwards assailed his rival as ‘an intellectual fence sitter who asks the people of Pembrokeshire to believe that a Cabinet of Donnelly’s will solve all Britain ‘s problems’. Concerning the Liberal Party he was equally dismissive – ‘all that is left are the pathetic lamentation s of a lost people ‘ – while Plaid Cymru, in his view, had become ‘inspired by hatred of the English rather than by love of Wales, and from that hatred springs its negative, inward looking character. In October the Donnelly camp received a welcome boost with the high court judgement that the officers elected by the Donnelly party at its meeting on 6 April had been properly chosen. Further, it was ruled that the funds and possessions of the party belonged to the Donnelly group.36 This rather unexpected outcome caused attitudes to harden on all sides. When George Thomas, formerly a close personal friend of Desmond Donnelly’s, now the recently appointed Secretary of State for Wales, spoke at Haver­fordwest at the end of October, he launched a sharp attack on Donnelly’s ‘wild outbursts’ and vigorously defended Harold Wilson .37 As the autumn ran its course, Nick Edwards and the Conservative Party machine clearly stepped up its campaign in Pembrokeshire. At the party conference convened at Blackpool in October, Edwards delivered an important, widely reported speech on the problems of the constituency and the urgent need for the government to devote resources to the development of an improved transport system: ‘The old industries are fading away and the employment prospects of many depended upon Government establish­ments that are threatened with closure. We now have the greatest oil port in the United Kingdom [in Milford Haven], but it is highly automated and employs few. The industrial complex that should go with it will remain a dream until we have a government which will recognise that the greatest single contribution they can make to the prosperity of many of the devel­opment areas is an adequate transport system ‘. In this speech he drew attention to the unusually high unemployment levels within Pembroke­shire and the very poor prospects of future employment – unless the govern­ment acted.38 Shortly afterwards, the Conservative candidate pressed government departments for an assurance that the projected concorde test flights over west Wales would not pose a threat to historic buildings like the St David ‘s Cathedral. On 16 February the Democratic Party published a detailed sixteen-page policy statement – ‘The objective is to save a sinking nation ‘. A mong its many proposals were a tough stance on ‘permissiveness ‘ – ‘Rome fell because of its permissive society. Britain’s permi ssive society is rotting the soul of the nation’. It consequently advocated raising the moral standards of television and radio programmes and newspaper s, a harder line on drug taking , and a rigorous review of the laws on abortion, homosexuality and divorce. Other policies included heavier penalties for convicted criminals, a re-assessment of capital punishment, and con­sideration of the introduction of corporal punishment. Income tax was to be cut to a flat rate of five shillings in the pound , while those earning less than £2000 per annum were to be exempt from the payment of income tax . An added-value tax was to be introduced , support for industry, and a clamp down on the trades unions and on immigration, together with a slimming-down of the civil service, and an increase in Britain’s defence commitments. 69 It was a notably right-wing agenda which immediately did have its supporters, indeed admirers, but it was also widely felt that there was also an element of ‘something for everyone’ in its contents. Most commentators agreed that the manifesto presented ‘a picture of an Utopia which the Democrats will never be given the chance to provide’. The proposals concerning taxation were considered bizarre and incapable of implementation , while surprise was voiced at the failure to discuss Britain and the EEC, a burning i ssue in 1970. 70 The same month – Feb­ ruary 1 970 – saw a widely reported political meeting at Haverfordwest addressed by Jim Callaghan, the home secretary, at a ti me of major dis­ enchantment among the county ‘s farming communities. Other political big guns, too, came to the remote constituency, including Michael Hesel­tine, the Conservative spokesman on transport, Edward Short, Cledwyn Hughes (a former secretary of state for Wales), and Mrs Barbara Castle, the secretary of state for employment and productivity. Mrs Castle told a Labour Party meeting at Haverfordwest that Donnelly ‘fell by the wayside when the going got tough. He should be repudiated for repudiating Socialism ‘. At a Democratic Party conference at Saundersfoot a week later, Desmond Donnelly retaliated sharply by asserting that Barbara Castle had ‘lied and cringed’ over trades union legislation the previous year.71 At the same conference he warned his followers against setting their sights too high. Early bravado about putting up a large number of Democrat Party candidates at the general election had by now largely dis­ appeared: ‘I would rather run ten candidates well than twenty indifferently. We have too many action stations. We have got to decide what constituencies we are going to fight. Do not let us set our sights too high ‘.72 The influx of Labour heavweight politicians into the constituency during the. re-elect10n and elect10n campaigns was often commented upon in political columns. Commentators attributed their anxiety to visit Pembrokeshire to the fact that Transport House now considered the seat ‘winnable’ and to Donnelly’s general lack of popularity among his former colleagues in the Labour fold. Before the end of the month, Welensky, clearly aware of the very real danger that Donnelly might reduce his chances of success in Pembroke­ shire by giving overmuch support to the other Democrat candidates scattered across the country, warned him kindly, ‘. . . I sincerely hope you will take my advice and concentrate on winning your own seat. You will of course help your candidates, but remember that, if you are defeated, it will be the end of the Party and I think, if this can be avoided, it is vital that it should be’ .82 Soon it was announced that the general election was to take place on 18 June 1970, and the local press i n Pembrokeshire revealed that the local contest was ‘neck and neck’ and published the following odds on the outcome of the election: Desmond Donnelly 5 to 2; Nicholas Edwards 4 to 5 favourite; Gordon Parry 5 to 4; and Wynne Samuel the 100 to 1 outsider. As it was widely felt that the traditional Liberal vote in the constituency had simply disintegrated, those with Liberal sympathies were encouraged to vote for their second choice can­didate. At the eleventh hour there was a switch in the Liberal candidate.83 Following the withdrawal of Alan Coulthard, the county Liberal Associa­tion first announced that it would not be putting up a candidate at the general election, but then stated that they had found a new aspirant in Wynford Thomas, a 22-year-old native of Loughor near Swansea who was a law student at the University College of Wales, Aberystwyth. Nationally the election was a presidential style campaign with the person­alities of Harold Wilson and Ted Heath looming large throughout, and the opinion polls generally suggested that the Labour Party would be returned to government with an overall majority of about twenty seats. The pre­ election campaign in remote Pembrokeshire had probably lasted longer than in any other constituency – ever since Desmond Donnelly had resigned the Labour whip, been expelled from the party and then formed his own Democratic Party, a series of events which threw the Labour Party organ­isation in the county into ‘disarray, confusion and consternation’. When Peter Walker, the shadow minister for housing and local government, spoke at the Masonic Hall, Haverfordwest on 15 May, shortly after the general election had been called, he anticipated ‘one of the dirtiest fought elections in history’ .84 Surprisingly, Desmond Donnelly rarely featured in news bulletins broadcast from London during the election campaign, and was just occasionally mentioned in passing as ‘a departed comrade from the Labour Party’. This may be explained by his absence from London as he campaigned hard within Pembrokeshire and in the other five con­stituencies where Democratic Party candidates were standing. 1. See J. Graham Jones, ‘Desmond Donnelly and Pembrokeshire politics, 1964- 70’, Journal of the Pembrokeshire Historical Society, No. 12 (2003), 67-102; and the fuller account available in Allen Layne, ‘Desmond Donnelly ‘, unpublished University of Miami Ph.D. thesis, 2004 . B. Pimlott, Harold Wilson (London, 1992), 357-58; K. 0. Morgan , Michael Foot : a Life (London , 2007), 239; M. Jones, Michael Foot (London, 1994), 288 . See also J . Grimond, Memoirs (London , 1979), 218-19. 3. P. Ziegler, Wilson: the authorized life of Lord Wilson of Rievaulx (London, 1 993), 2 1 5; The Times, 26 July 1966. 4. Western Telegraph, 29 June 1967. 5. N ational Library of Wales (hereafter NLW), Pembrokeshire Conservative Assoc i ation Records, file 74, W. E. Austen , Opposition Whips’ Office, House of Commons, to W. V. Weale, Pembrokeshire Con servative and Unionist Association , Haverfordwest, 27 November 1967. 6. House of Commons Debates, 5th series, vol. 754, cc. 1196-1201 (21 Novem­ber 1967). 7 . The Times, 19 and 29 January 1968. Donnelly ‘s resignation letter to John Silkin , the government chief whip, dated 18 January 1 968, was publish in full in The Times, 9 January 1 968. 8. The Times , 20 January 1968. See also ‘Stormy petrel Donnelly is so popular ‘, Western. Mail, 20 January 1968, for a sympathetic evaluation of Donnelly’s local popularity. 9. The Times, 1 February 1 968. 10. The Times, 1 2 February 1968. 11. Western Mail, 9 March 1968.
entry for 21 February 1968. 13. The Times, 21 and 23 March 1968. 14. Minutes of meeting of the Pembrokeshire Constituency Labour Party, 29 March 1 968, cited in Layne, op. cit., p. 334. 17. Western Telegraph , 28 February and 14 March 1 968. 18. Western Telegraph, 2 1 March 1968. 19. . NLW, Pembrokeshire Conservative Association Records, file 74, draft of letter in the hand of Desmond Donnelly to local newspapers [March l 968]. At the close of the campaign Nicholas Edwards was able to prove that some of the letters printed in the local press attacking him and supporting Donnelly were in fact penned by Donnelly and published under false names. 20. The Times, 8 and 10 April 1968. 22. NLW, Lord Crickhowell Papers 4/1 , scrapbook I, unlabelled press cutting from a local newspaper, letter from Colonel I. M. Fogbound, late 1st Battalion, Pembrokeshire Airborne Regiment. 23. NLW, Lord Crickhowell Papers 4/1, scrapbook I, unlabelled press cuttings. 25. The Times, 18 May 1968; NLW, Labour Party Wales Archives, vol. 12, execu- tive committee minutes, 17 J une 1 968. 26. West Wales Guardian, 3 and 31 May 1968; Western Mail, 5 June 1968. 27. The Times, 24 June 1968. 28. The Times, 1 1 , 13 and 15 July 1 968. 29. Western Telegraph, 4 July 1968. 30. NLW, Lord Crickhowell Papers 4/ I, scrapbook I, unlabelled press cuttings. 31. West Wales Guardian, II October 1 968. 33. NLW, Lord Crickhowell Papers 4/1, scrapbook 1, unlabelled press cutting from the Western Telegraph. 34. West Wales Guardian, 6 September 1968. L. Wolstenholme, 23 September 1968 (copy); Wolstenholme to Weale, 25 Sep­ tember 1968. 36. The outcome of the court case was widely reported in the national press. See the reports in The Times, 18 October 1 968, Manchester Guardian, 19 October 1968, Daily Telegraph, 19 October 1968, and the Western Mail, 18 October 1968. 37. Western Telegraph, 3 October 1968. 38. Western Telegraph, 1 7 October 1968. 39. NLW, Lord Crickhowell Papers 4/1 , scrapbook I, unlabelled press cuttings. 40. Western Telegraph, 21 November 1 968; West Wales Guardian, 22 and 29 November and 6 December 1 968; Western Mail, 30 November 1968; NLW, Lord Crickhowell Papers 4/1, scrapbook I, letter from Edward Heath to Nicholas Edwards , 30 November 1 968. 41. Western Telegraph, 12 December 1 968. 42. Western Telegraph, 26 December 1 968. 43. West Wales Guardian, 20 December 1968. See also the Western Mail, 24 October 1968, and Layne, op. cit., pp. 349-51 . 46. NLW, Lord Crickhowell Papers 4/1, scrapbook 2, unlabelled press cuttings. 47. Western Telegraph, 6 March 1969; West Wales Guardian, 7 March 1969. 48. NLW, Desmond Donnelly Papers, file A 1041, Donnelly to Sir Roy Welensky, 15 March 1969 (copy). 49. Layne, op. cit., pp. 352-53. 50. West Wales Guardian, 4 April 1969. 51. The Times, 1 April 1969; Western Telegraph, 3 April 1969.
of State for Social Services, 1968-70 (London, 1977), 447, diary entry for 20 April 1969. 53. NLW, Lord Crickhowell Papers 4/1, scrapbook 2, unlabelled press cutting. 54. The Times, 28 May 1969; Western Telegraph, 8 June 1969; South Wales Evening Post, 2 June 1969; Layne, op. cit., p. 354. 55. Robert Skidelsky, ‘Any chance for Donnelly?’, Sunday Telegraph, 8 June 1 969. 56. NLW, Desmond Donnelly Papers, file F63, unlabelled press cutting from the West Wales Guardian, [June 1969]; Western Telegraph, 12 June 1969. 58. Noted in The Times, 22 September 1969. 59. West Wales Guardian, 19 September 1969. 60. See ‘Donnelly satisfied with Democratic vote’ , West Wales Guardian, 31 October 1 969. 61 . West Wales Guardian, I O October 1969; Sentinel , 23 October 1969. 62. Western Telegraph, 23 October 1969. 63. NLW, Lord Crickhowell Papers 4/1 , scrapbook 3, unlabelled press cutting. 64. Derby Evening Telegraph, 31 December 1969. See also the interesting article by ‘Radar’ in the Lincolnshire Echo, 2 January 1970 – ‘1970 target for Donnelly the Democrat’. 65. West Wales Guardian, 9 January 1970. 66. The Times, 27 February 1970. 67. Ibid. See also the report in the West Wales Guardian, 27 February 1 970, and the article by David Rosser in the Western Mail, 27 February 1 970. 68. Western Telegraph, 19 March 1970; West Wales Guardian, 20 March 1 970. 69. See the summary in the Daily Mail, 1 6 February 1 970. There are references, too, in a number of many other newspapers and journals. 70. West Wales Guardian, 20 February 1970. 71. Western Telegraph, 19 March 1970. 72. Western Mail, 16 March 1970. 73. Noted in The Times, 4 April 1970. 74. Western Telegraph, 16 April 1970. 75. Norwich Mercury, 24 April 1 970. 76. See the ‘Cross-bencher’ column i n the Sunday Express, 26 April 1970. 77. NLW, Desmond Donnelly Papers C7, Donnelly’s diary entry, 1 6 April 1970, ‘The British General Election’. 78. NLW, Desmond Donnelly Papers file A 1040, no. 47, Donnelly to Dean Acheson, 16 April  (copy). 79. NLW, Desmond Donnelly Papers file A 1040, no. 49, Donnelly to Dean Acheson , 26 April 1 970 (copy). 80. The Times, 6 May 1 970. Also reported in the South Wales Argus, 6 May 1970. 81. NLW, Desmond Donnelly Papers, file A l 041 , no. 50, Donnelly to Sir Roy Welensky, 5 May 1970 (copy). 82. Ibid. no. 52, Welensky to Donnelly, 20 May 1 970 (‘Dictated 17.5.70’). 83. Western Telegraph, 2 l May 1970. 85. Western Telegraph, 4 June 1970. The letter was quoted in full in the West Wales Guardian, 5 June 1970. Western Telegraph, 11 and 18 June 1970. 86. The Times, I June 1970; West Wales Guardian, 12 June 1970. 87. Ibid . and further press cuttings in the NLW, Desmond Donnelly Papers, file F70. 88. See D. Butler and M. Pinto-Duschinsky, The British General Election of 1970 (London, 1971), 412. 89. See the reflections in N. Crickhowell, Westminster, Wales and Water (Cardiff, 1999).